The Nashville Predators look to avenge their second round exist last year by going even deeper into the playoffs this year. Unfortunately for Preds’ fans, the path to the Conference finals begins in Detroit against a veteran-laden Red Wings squad that are also seeking redemption for an early exit last year. The Preds look quite intimidating this year, especially with late-season additions Paul Gaustad, Hall Gill and Alexander Radulov. They boast the best defense pairing in the league in Shea Weber and Ryan Suter and perhaps the best goaltender in Pekka Rinne. Nashville is a popular pick as the darkhorse to emerge from the Western Conference. This will be a great series for fans, but unfortunate that a powerhouse team will be gone after the first round. The Red Wings boast a well-rounded group as well and this series looks to go the distance. Pavel Datsyuk demonstrated his skill and two-way play once again and the Wings will not roll over easily. · Can Datsyuk battle through Weber/Suter and Rinne? 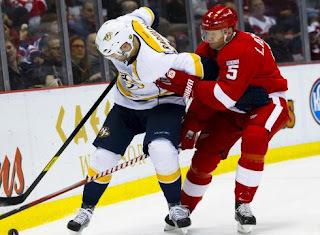 · Will the Predators new additions overcome the Wings experience? · Can Jimmy Howard match Pekka Rinne? Expect this series to go the distance. Home ice advantage may be key, and the Predators enjoy that luxury. Predators in 7. Canucks Off-Season: Raymond, Luongo, Vigneault?